What if successful startups are just lucky? That was the question that Vianney Lecroart, a programmer and entrepreneur from Paris, asked in his essay a few months ago. It started an interesting and heated discussion in Hacker News and Reddit. Lecroart argued that, since there are too many variables that goes into building a successful startup worth $10 million+, even if it’s not random, it’s too complex to be controlled. One things I consistently see in a lot of successful entrepreneurs is that they have this powerful and contagious belief that they are in control of their own destiny and success. Then along comes “Lean Startup.” Entrepreneurs and innovators saw it incorrectly as the excalibur sword that will slay any dragons that stood in their way of Google-like success. But, applying the lean startup principles to new ventures doesn’t guarantee success. Sure, you can de-risk as much as possible. But in the end, there are way too many moving parts to predict success. So what’s luck to do with it? That’s what Nassim Nicholas Taleb said in his book, Fooled by Randomness: The Hidden Role of Chance in Life and in the Markets. In other words, luck is earned. Kabir Shahani, CEO of Appature, which was acquired by IMS Health last year, noted the importance of luck. As an entrepreneur, you have to rely on luck. Honestly, being an entrepreneur, in my opinion, is 95 percent luck; four percent knowing when to recognize it; and one percent hard work. I mean, that’s the equation. Luck is the secret sauce of successful people whether in startups or not. As I write this in the ‘dungeon’ at Boost Accelerator here in Silicon Valley, I’m still shell-shocked how I got here. If Joy from Lean Startup Machine Toronto didn’t see my tweet, if I didn’t get invited to speak at Lean Startup Machine, if my application to speak at Lean Startup conference was rejected, if I didn’t write that essay about landing pages, I wouldn’t be here. The stars aligned. There’s no other way to put it. Put yourself out there. 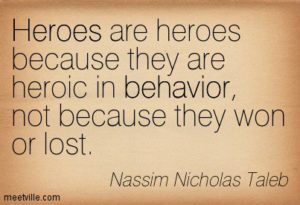 Be heroic in behavior. Earn. That. Luck. Interested to read more about startups? Subscribe to my email list or follow me on Twitter (@RamliJohn). I only write at most 1 blog post per week to make it REALLY good. With the infrequency of my posts, you will likely miss them unless you join my newsletter. Let's get social. Send me a LinkedIn connection request, follow me on Twitter or subscribe to my blog's RSS feed. Just one more step to growth strategies, conversion optimization tips, and stuff that gives you a competitive advantage over others....every week....via email.